LAPD To Buy Chevy-Badged Holden Commodore Police Cars? 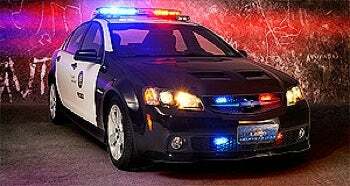 Starting with the LAPD, up to 40,000 Chevrolet-badged Commodore police vehicles could be exported annually in a deal to replace Pontiac G8 volume lost by GM killing Pontiac. A re-badged Commodore police car? Sweet. This after the folks at Melbourne's National Safety Agency put together the above LAPD-liveried Chevy-badged Commodore for the 2009 APCO Australasia Conference & Exhibition last month in Sydney. The expectation is the LAPD would be the first police force to buy the new vehicle, with more exports potentially going to Canada, the UK and the Middle East. "...a plan to supply hi-tech Australian-made patrol cars to US law enforcement agencies – led by the Los Angeles Police Department (LAPD) – could be joined by lucrative police vehicle exports to Canada, the UK and the Middle East. In an ironic twist, if green-lighted, the police project could see Holden's Commodore effectively replace Ford's aged Crown Victoria as the vehicle of choice for many US police departments, which require large, V8-powered rear-drive sedans. The Crown Victoria, which was discontinued from public sale in 2008 and will be phased out of production for US fleet customers next year, has long been touted as Ford Australia's most obvious US export opportunity for the Falcon. Some US police departments have already adopted Dodge's new Charger, but the Crown Victoria still attracts 60,000 annual sales for Ford, representing a potentially massive export opportunity for Holden. Officially, Holden remains cautious about spruiking the prospects of sending Commodores to the US as part of a police vehicle export program, but national media relations manager Scott Whiffin admitted to GoAuto this week that a Pontiac G8-based LAPD prototype produced by Port Melbourne-based National Safety Agency (NSA) has "enormous" potential.